In the summer of 2015 the local council called for volunteers to be ready to grit and clear pavements in case of a heavy snowfall in the coming winter. It sounded like a satisfyingly mindless yet civic-minded thing to do, and also something I could square in my mind with a natural reluctance to help a Tory-run council. No local authority of any political persuasion had ever cleared snow from pavements as far as I know, so it wouldn’t be as if I was making it easier for the council to quietly stop doing something it had previously taken responsibility for. The only time I’ve seen a city employee clearing snow from pavements was in 1980’s West Berlin. It was early morning, just hours after heavy snow had started to fall, and a man was operating a sort of mechanical pavement plough. He wore no gloves, I recall. No wonder the German army was so close to defeating Russia in WW2. Back to 2015 and a small band of volunteers – not one of us under 50 – met at Kingston council’s offices to receive instructions about when to grit, and to get taken through a few health and safety dos and don’ts. 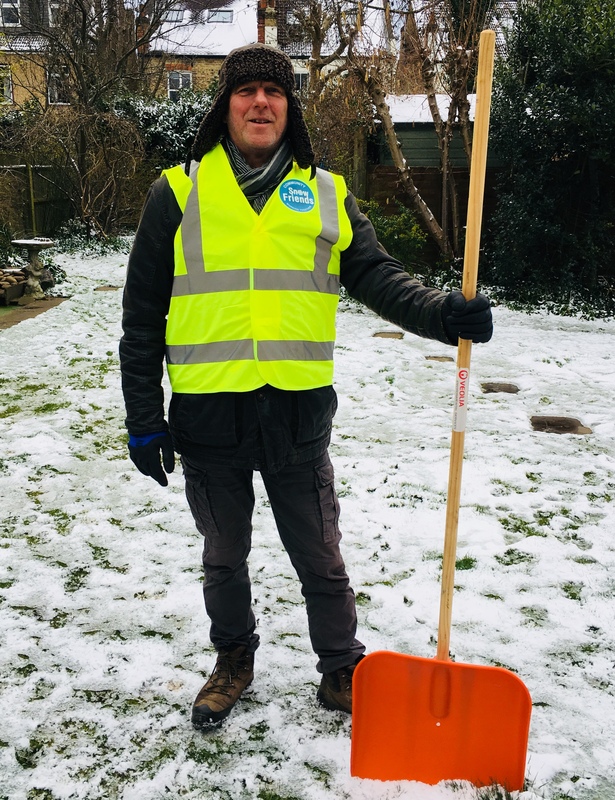 Then we were issued with warm gloves, anti-slip snow grippers, a big snow shovel and a hi-viz yellow tabard emblazoned with the Snow Friends logo. The grit caddies would be delivered later. I made my way home in bright sunshine wearing shorts and sunnies and incongruously carrying a two-metre snow shovel. It was a long wait. There was no snow in the winter of 2015/16 or again the following year. But then came 2018 and the warnings about the Beast from the East. My time had come. But where was the grit? I asked the council’s twitter feed and within a few days about 20 kilos of the stuff arrived in a big plastic container. The idea is to scoop out about two kilos at a time into a smaller caddy and use a small hand shovel to scatter it on the pavement as you slowly walk along. Then you go back and refill. An email from the council provided a weather forecast but fell short of actually telling us when we should get to work, which I thought was a bit lame. So I kept listening to the BBC, checking Metcheck and asking Siri and Alexa until, on a cold day in late February, everyone agreed that snow was imminent. To the dressing-up box! There was proper snow after the Beast from the East. This pic was taken a few weeks later, during the Least from the East. First, I tried out my improvised pavement grit spreader, a repurposed garden tool designed for spreading grass seeds. I assembled the contraption, filled it with a handful of grit, gave it a little push and it seemed to work. My stroke of inspiration meant I wouldn’t have to keep going back for grit refills. However, my test drive in the garden wasn’t indicative of actual conditions out in the field, or rather the pavement. A full load of grit clogged the spreader’s outlets, resulting in only a few grains falling through as I pushed the thing forwards. So I tried a vigorous up-and-down shaking motion as I walked, looking like someone with Parkinson’s struggling to control an unruly garden implement. The technique lasted just a few steps before I inadvertently yanked the handle out of the hopper part. I picked up the pieces and took them home. Clearly not designed for heavy-duty gritting work. Any fool can see that. So it was back to the council-approved manual method. I started gritting the route I take when I’m walking to the railway station, which is to say the route most commuters, somewhat bizarrely, don’t. (A spatial phenomenon I bored blogged about here). I’d only got half-way down the road when I spotted a council worker rapidly advancing towards me. He was gritting the pavement too, using a rugged hand-operated grit spreader that was clearly designed for the purpose, unlike my lightweight plastic effort. The grit was spraying out evenly in an impressive metre-wide arc. He ran while he gritted, which I thought was keen. He clattered past without a word, spreading grit more efficiently over where I’d just been with my laborious and now decidedly analogue scoop-and-scatter technique. There was no point continuing, so I switched routes. Remembering my earlier commitment to civic-mindedness, I chose the route that people actually take as they head to the station, even though they’re clearly wrongheaded about this. I reached about half way to the station before exhausting my supply of grit. Back home, I emailed the council requesting more. I also annotated a Google map showing where I’d been. Perhaps, I suggested, they might post an interactive version of the map on the council’s website so that volunteers could see where fellow Snow Friends had gritted, thus eliminating duplication. They were so overwhelmed with the brilliance of my brainwave that they were rendered incapable of forming a coherent response, or indeed an incoherent one. 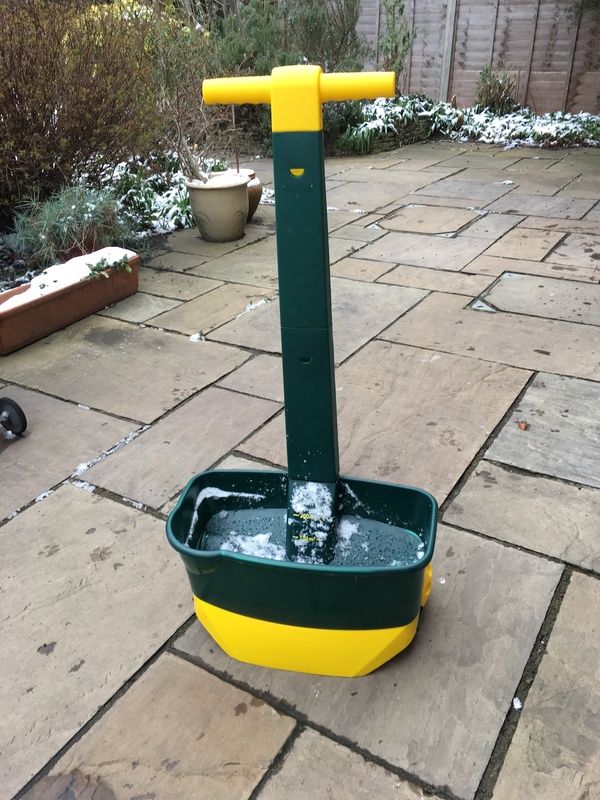 My email went unheeded, my grit caddy was never replenished and, despite more snow falling and ice forming over the following days, my Snow Friend days appeared to be at an end. But if my efforts helped prevent just one child from slipping into the path of an out-of-control juggernaut, it will all have been worthwhile.